Dar7louyat is a “riad” or rather a “dar”, a traditional old house typical of the Medina and the Islamic architecture. It was long inhabited by scholars of the Qarayouine mosque. Our house was proceeded a long and careful restoration according to the traditional rules of local architecture. 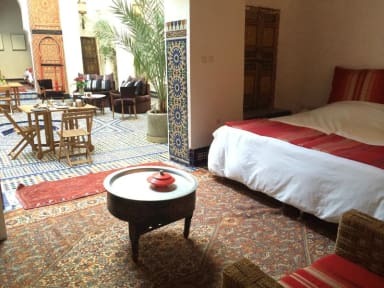 Its architectural features are made of elegance and lightness, resulting thanks to the art skills of the owner in a feeling of rest and peace which contrasts with the busy activity of the Medina. Dar7louyat is located 37 sbaa Louyat (the street of the seven curves), next to Qaraouiyine Mosque. very busy Medina with all craft activities, souks and traditional shops. 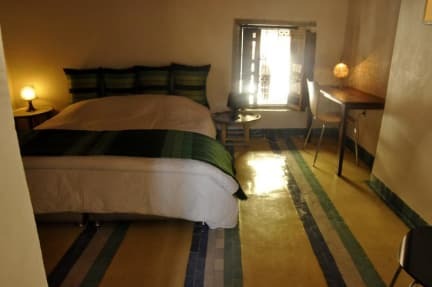 Dar7louyat can accommodate up to 18 people. Comfort for a relaxing stay is provided thanks to 6 large bedrooms and suites each with its own en suite bathroom. Check in from 10:00 to 19:00 .